Major storm hitting the region today, and into tomorrow! This will produce immaculate conditions on the slopes for the next few days. This weekend also looks great for the resorts, with the chance of a few upsloping snow showers in certain locations. Details on everything are below! The secondary low will move into the Mid-Atlantic, strengthening and beginning to merge/interact with the primary low in the Great Lakes Region early this afternoon. Snow will move in from southeast to northwest as the low moves just south of Long Island by around 1 pm. Snowfall rates will become heavier as we move through the afternoon, especially at the southern coast, as easterly winds begin to increase. Some mixing is possible in southern New England this afternoon, but the low will move far enough offshore overnight to keep any rain at bay by Thursday. Snow intensity will be heaviest overnight into Thursday for northern New England, with locally heavier bands, with heightened easterly winds at 10-15 mph with gusts up to 30 mph in southeastern New England. This will make visibility much worse. The storm will circulate just off of Cape Cod and into the Gulf of Maine, continuing to pull moisture in off the ocean and bringing heavy bands of snow to eastern ME by Thursday morning. NH and VT will still see snowfall, with heavier rates still going strong in east NH and northeast MA, following the path of the low. Snow will continue throughout the day on Thursday, becoming lighter and more broken by the afternoon. Temperatures will be in the low to mid 30’s, keeping any rainfall near or offshore. Locations in coastal regions can expect heavier snow, weighing down on trees and power lines. The low will actually swing back around into northern ME, meaning snow showers will linger through Thursday night and evening into Friday, especially for the northern half of the region. Winds will die down significantly, though there could still be additional upsloping accumulations as winds shift northwest. Temperatures will again be in the low 30’s. The mountainous regions in northwest VT could see snow showers linger through Friday night, making this an impressive storm in terms of length. However, not much additional accumulation should come from these scattered snow showers. After all is said and done, snow totals are going to be in excess of a foot for most of New England, with the exception of a few locations. As the storm moves out of the region, this weekend will see well above average conditions on the slopes. With the center of low pressure out to sea, a northwesterly wind will begin to flow into the area. This kind of flow often creates local upsloping snowstorms on the slopes. This is very typical for Jay Peak, and northern VT resorts around it. That’s not to say that the Whites, or southern ME mountains won’t see any kind of upsloping snowfall from this flow as well. Overall don’t expect anything crazy for the slopes, but expect a decent amount of fresh powder on the slopes for northern VT, and sections of the Whites/Sunday River region. Temperatures will remain below freezing in the mountains this weekend, so don’t expect any kind of melting on the slopes. Conditions will remain light, and powdery, even as we move into Sunday. The region won’t see as much upsloping storms that day, but it’ll be a clear and beautiful on the slopes. It also won’t be as gusty compared to Saturday, so no chance for any kind of wind delays. If we had to suggest a day for you to head out this weekend, it’d be Saturday. There will still be some residual powder from Wednesday’s and Thursday’s storm this week, and the upsloping snow will only add to that. Sunday will have crystal clear conditions, but simply won’t have the powdery conditions that Saturday will have. Looking way far into the future, there are some scattered showers tracking to hit the region Tuesday through Wednesday of next week. That can obviously change a lot as we move closer, but just be aware of the chance for the middle of the upcoming work week producing some powder for the slopes. That’s all we have for you today! Have a fantastic time on the slopes over the next few days everyone! Winter is still kicking around, might as well enjoy it while you can. Stay safe, and have fun! 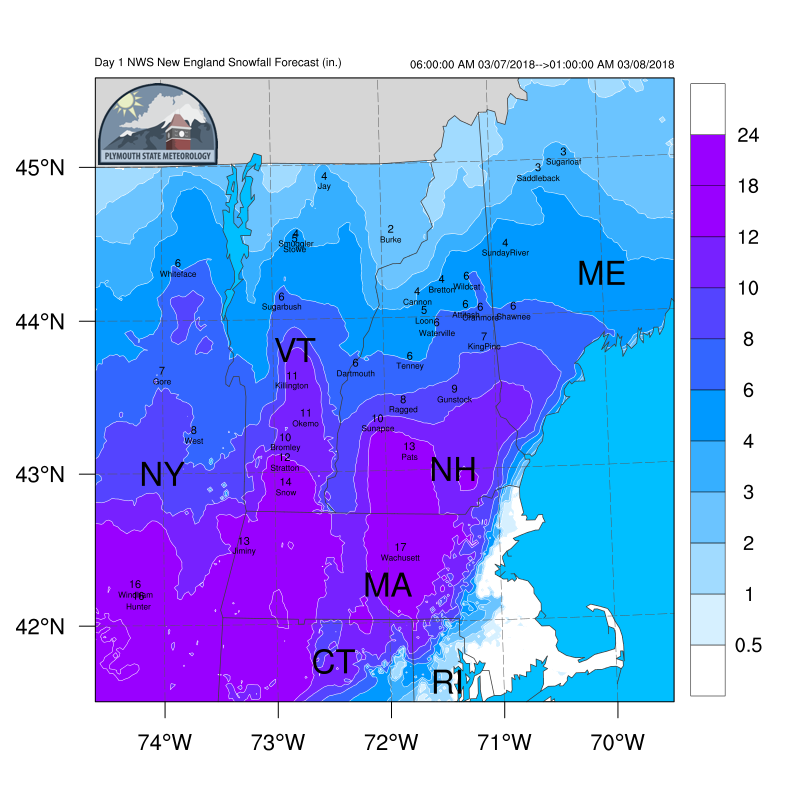 OpenSnow was created by a team of local weather forecasters who are life-long skiers and riders. Stay up-to-date with the latest snow forecast via our team of local forecasters and download the iOS or Andriod App so you never miss another powder day!